If you find yourself hiking the Als Trail (Alsstien) then you will at some point stumble across an opening in the middle of the forest called Blommeskobbel where you see two huge circles of stone. These stones mark the remains of two burial mounds – or long barrows, as they are called. This is a great place for a break on the walk and you can try to imagine what this place must have been like when it was built many centuries ago. The trees gave some shelter but it was as damp and muddy and joyless as you could ever want. Blommeskobbel cheered me though. How could it not? The site consists of two langdyssers and two round barrows, with good kerbing, nicely exposed chambers and lots of character. The barrows are a massive 34 and 53 meters long and since the top has been removed ages ago you can see the 20-ton heavy cover stone that makes the roof of the actual burial chamber. 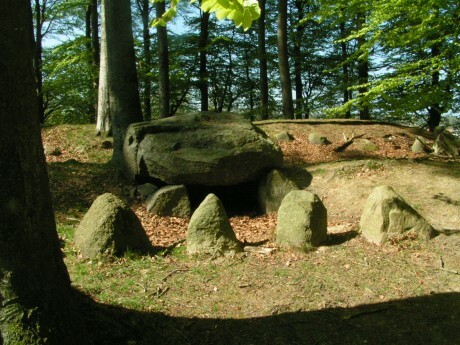 The barrows are thought to be constructed in the neolithic period, which in Denmark was around 3600 – 3200 B.C., as burial mounds for powerful people in the community at the time. I’ve heard people mention that Als should have some of Denmark’s oldest long barrows but have not found any sources for that online. In 1935 the barrows were excavated but grave robbers had already been there so the excavations did not bring much new to light. They found a clay jug and a flint knife from a later age. In May the archeological museum in Haderslev did a special talk about the barrows where they presented some pictures from the excavation and restoration. If you arrive by car you need to follow the gravel road to the parking lot at the edge of the forest and then walk according to the signs from there. 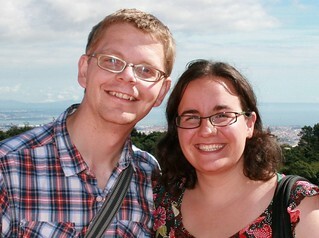 The picture is taken from Dansk Naturfredningsforening. This entry was posted in Things To Do and Sights and tagged als, Alsstien, Archaeology, barrows, Blommeskobbel, history, long barrow, neolithic, prehistory, sight by Michael. Bookmark the permalink.